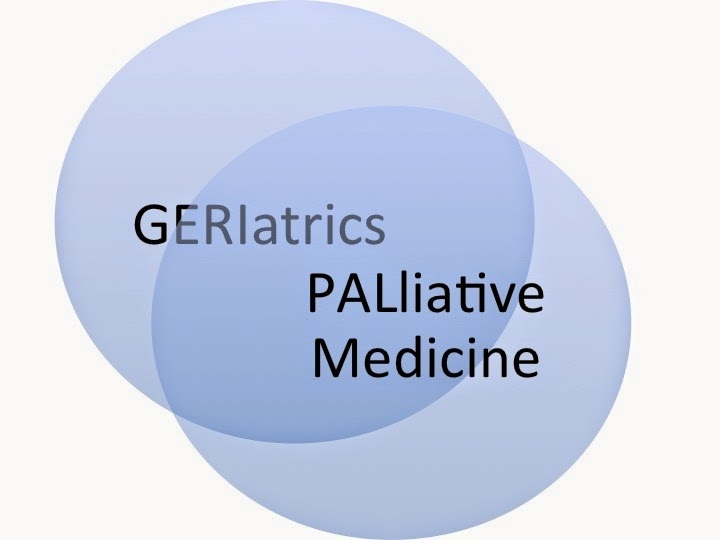 Over the past decade, the disciplines of Geriatrics and Palliative Medicine have become intellectual cousins. Within Palliative Medicine, the recognition that Palliative Medicine is not just about end of life care has been a paradigm shift. There is now recognition that core skills of Palliative Medicine, including symptom management, communication, and caregiver support are needed throughout the course of serious illness. While these needs of seriously ill patients transcend age, it is a demographic fact that older persons will be the bulk of persons with these chronic palliative care needs. So, the population that has long been of interest to Geriatrics is now of great interest to Palliative Medicine. Within Geriatrics, we have become consumed with the recognition that most frail older persons have multiple illnesses. We realize that treating each illness separately, rather than treating the whole patient leads to considerable harm. Geriatricians strongly advocate for a focus on whole person health outcomes such quality of life and functional status rather than traditional disease metrics. Geriatricians have been increasingly concerned that traditional treatments focused on each individual diagnosis leads to dangerous levels of overtreatment that can harm patients. So, given this overlap between the two fields, shouldn’t the next step for each field be to aggressively define and defend its turf? Two wonderful perspectives, by Jim Pacala and Diane Meier in the Journal of the American Geriatrics Society, eloquently argue that the answer to this question is an emphatic NO! These thoughtful perspectives are great reading for those in both fields. Pacala and Meier implore us to put a laser focus on the needs of seriously ill patients, rather than worry about who has what turf. Both fields focus on the most vulnerable patients, the 5% of patients who consume 50% of health costs. Yet for all that money, our health system is utterly failing these vulnerable patients, delivering disjointed, dysfunctional care that does not meet their needs and goals, and often causes harm rather than benefit. We should of course embrace what is unique about each discipline and value the specialized skills each discipline may bring to the table. But, Pacala and Meier tell us that we have so much more to gain by collaborating and working together than worrying about turf. Perhaps the most important feature that unites those in Geriatrics and Palliative Medicine is the passionate belief that we need to change how health care is delivered to seriously ill patients. With needs so great, we do not need to worry about turf. There is more than enough work to go around. By working together, we can offer hope to seriously ill patients and their caregivers who feel that their voices are not being heard. In early 2009 my wife Donna was dx with Stage IV cancer she passed away in Aug of 2011. She and I (her caregiver) benefited from the palliative care provided by her oncologist and his team as well as her final weeks in hospice. I have written about these experiences and podcasts. I believe and know first hand what palliative care and hospice provided both the patient and caregiver. "Hospice, Palliative Care and End of Life: Practical Considerations"
"Podcast #19: Entering Hospice Dignity in the Face of Fear"
What do you hope a reader/patient will do about this? And please tell us what specific actions are being taken now. Thanks so much for your thoughtful review of this important topic. Reading the article by Doctors Pacala and Meier reminds me of a few key issues that I have seen in the health care marketplace over the past thirty years. First, many of those who started the field of Palliative Care Medicine, came from the field of Geriatrics. They had left the field due to the inability to find satisfactory employment. They also encountered a healthcare system that was not friendly or welcoming to the approach that most Geriatricians took. By honing in on the key elements of Palliative Care in specific patient populations, they were able to provide the type of care that we Geriatricians have always believed in. Palliative Care has managed to grow, but I believe has begun to and will continue to run into many of the same issues that Geriatrics has faced in the marketplace. This is one of the main reasons that Geriatrics and Palliative Care must work arm in arm in working in today's healthcare world. As was also mentioned in the articles, don't forget the long term care and home care physicians, who have also found their unique niches. Unfortunately, by being part of separate organizations in a highly political healthcare environment, the clout of each group is minimized. Articles such as this should be a call to arms for all of us who care for the most vulnerable members of our society to find ways to work together to improve the system. Thank you Dr. Wasserman, your dedication to our Geriatric population, it was a pleasure to work with you.